Free UK Next Day Delivery! DO YOU HAVE A WATCH LIKE THIS TO SELL? 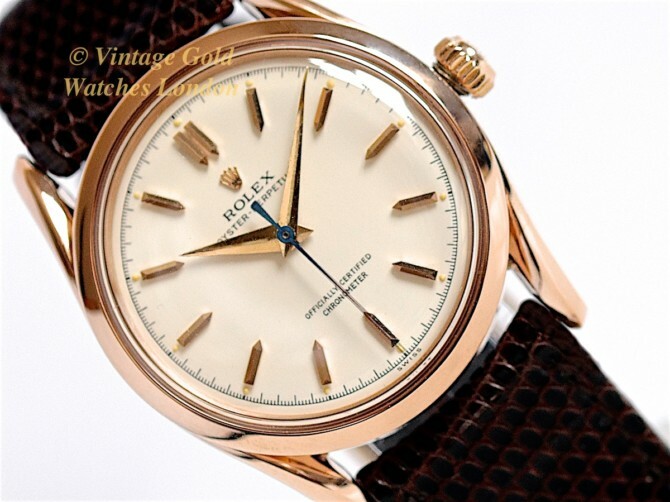 Here we have a simply wonderful and very rare Rolex Oyster Perpetual ‘Bombé’ in 18ct Pink Gold from 1953. This is a rare, Rolex model reference 6290, so-called “Bombay” by some collectors, referring to the bombé (sculpted) lugs on the case. This example has seen extremely light use and is in mint condition and comes with the more sought after smooth bezel. The condition is truly outstanding. The rarity, beauty and condition of this vintage Rolex means this a very special timepiece indeed! A beautifully elegant Ivory Cream dial with applied pencil hour indices matched by original ‘Dauphine’ hands. This simple design reflects the elegance and style of the late 1940s and early ’50s Rolex dials. It is beautifully symmetrical and well balanced. The yellow gilt hands and hour indices, along with the blued steel seconds hand, contrast beautifully with the dial, bezel and case. The dial is signed Rolex Oyster Perpetual and has the applied Rolex Coronet below double pencil hour indices at ’12’ and also ‘Officially Certified Chronometer’ at ‘6’ along with ‘Swiss’ at the very bottom of the dial. The outer seconds track is subdivided into fifths of a second. This is the original dial which has been restored to the very highest standards by our dial restorers who are considered the best in the UK. The rare Rolex Oyster, 18ct pink gold case, measures 34mm in diameter, excluding the original Rolex signed screw-down crown. This beautiful ‘Bombé’ design case with beautifully sculpted lugs transforms the case into something much more special and classy than the usual Oyster case. Bombé cases are rare, and in 18ct Pink Gold, these are almost never seen. The reason for this is they were only made to special order on behalf of a specific customer. Furthermore, pink gold was not so popular at the time, so only very few were made. The case also has the more sought after smooth bezel, which just like the rest of the case, is in immaculate condition. Inside the case-back, all the markings are correct and as expected, with the beautiful, older Rolex scroll signature, Geneva Swiss 18ct hallmarks and 0.0750, along with the Rolex model number 6290. Externally between the lugs at 12 o’clock is the clearly defined ‘Brevet’ and the model number ‘6290’ and between the lugs at 6 o’clock, the serial number of the watch ‘998267’ and ‘Model Depose’ is also clearly defined, indicating the year of manufacture as 1953. This watch has its original high grade “Officially Certified Chronometer” 18 Jewels, Calibre.640, Super Balance, automatic chronometer movement which is highly regarded for being particularly accurate, reliable and strong. The movement is working perfectly following a thorough overhaul and service by our vintage Rolex specialist watchmaker. After calibration and timing, the movement is running strongly and accurately at + 10 seconds per day. This is excellent for any watch of this age and we have confirmed this with our electronic Timegrapher. This movement has a 41 hour power reserve. The movement is signed Rolex, Swiss Made Patented Super Balance. This watch movement is now ready for many more years of faithful service and is perfectly suited for daily use and is offered with 12 months’ warranty on the movement*. Please note – our 12 months’ warranty is only applicable if the list price is paid. The watch is fitted with a genuine Rolex Brown Lizard strap and matching gold plated Rolex buckle. However, if a different colour or style of strap is preferred, please let us know and we will do our best to oblige free of charge. We carry tan, conker, dark brown and black in stock in plain padded leather, crocodile skin or lizard skin. We can also obtain most types and colours from our partners at ‘Watch Obsession’ within 48hrs. Please take a look at their huge range of 19mm straps if you wish here. Although there are no original papers with this watch, the reference numbers, markings, signatures and hallmarks are all correct, dating this watch to 1953. Detailed particulars will be included with the receipt, along with our 12 months’ Warranty*. A separate insurance valuation for the replacement value of this watch will also be provided at the time of sale along with our unique ‘Lifetime Authenticity Guarantee’ which states: “If this watch proves to be anything less than totally authentic, or not as described, Vintage Gold Watches of London will offer you a full refund at any time”. The Rolex Oyster Deluxe presentation box as shown in the photographs is included in the sale. This is a truly first class example of a 1953 vintage Rolex Oyster Perpetual which is ready to wear and completely practical for everyday use. If treated with care, it will make an excellent investment or heirloom piece and even though vintage gold Rolex prices have risen markedly recently, we still feel good examples such as this are still undervalued. As each year goes by and the world market for vintage gold Rolex watches continues to expand, prices will continue to climb ever higher. To summarise, this is a highly collectable vintage watch from horology’s most famous name, which is ready to wear, use, treasure and enjoy, providing excellent reliability and a sound financial investment, as long-lasting as the watch itself! A word on our prices – We always try our hardest to acquire the very highest quality watches we can find, before then restoring them to the highest possible standards. We then offer these at the fairest prices we can, taking into account our pre and post sales care and service. This approach means we will never be the cheapest, but nor will we be the most expensive. Indeed there are some well known stores in West London which are highly successful charging between two to three times the price you see here. We therefore consider our prices to be fair, given the quality of watches we have to offer. We are happy to accept PayPal as this is the quickest method of payment. However, if you would like to pay by UK cheque or by UK bank transfer we will be pleased to assist you with this and pass on a 3% saving to you. Similarly, if you wish to pay by International SWIFT or Bank Wire Transfer we will provide you with our BIC / Swift number and our IBAN number. Please note, we welcome part exchanges. If you have a watch or small collection for sale, please contact us as we will be happy to discuss. We will also be happy to Service your watch, Repair your watch or Restore your watch, all at ‘sensible’ prices. Please see here. Please take a look at our other fine vintage gold watches. HAVE A WATCH TO SELL? We are keen to buy your vintage watch. Or take it in part-exchange. Particularly if it is a gold watch and one of the brands you see above. Or you can fill out our enquiry form and we'll do our very best to help you.